Photograph of Dighton Rock taken in 1893. 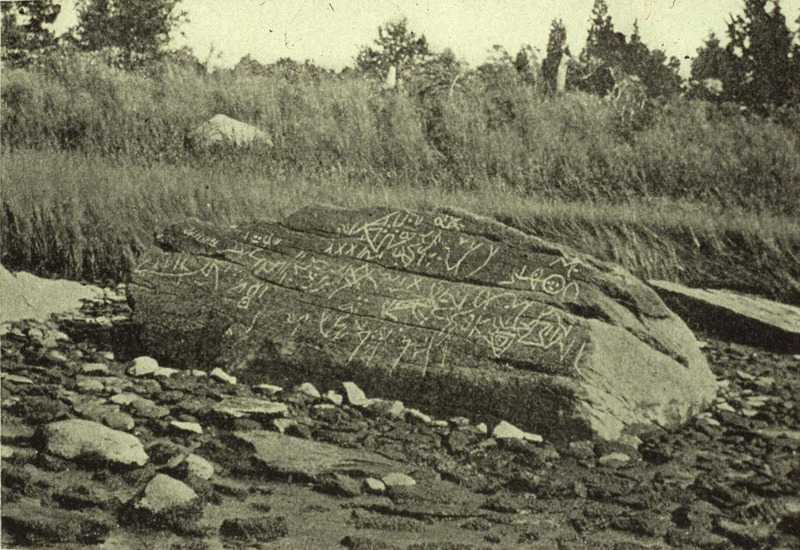 The Dighton Rock, found in the riverbed of the Taunton River in current Berkley, Massachsetts, formerly part of the town of Dighton, has been an interesting controversy since 1912 when Edmund Delabarre, a Brown University Professor, wrote that markings on the Dighton Rock suggest that Miguel Core-Real, a Portuguese sailor made the inscriptions. Miguel Corte-Real was a son of João Vaz Corte-Real and a brother of explorer Gaspar Corte-Real. Gaspar explored Greenland in 1499. He stayed there for several months with his team before icebergs forced them to return to Portugal. The Portuguese brothers Gaspar and Miguel Corte-Real both vanished during separate voyages to the coastline of modern-day Canada. In 1501 Gaspar led a three-ship fleet on an expedition to the shores of Newfoundland. After claiming 57 First Nations people as slaves, he tasked his brother Miguel with ferrying them back to Portugal. Gaspar was expected to follow shortly thereafter, but neither he nor his ship were never seen again. I’m left wondering what happened to those Native slaves in Portugal. Miguel Corte-Real returned to the New World in 1502 on a quest to find and rescue his brother. After arriving in Newfoundland, his three caravels split up and began a frantic search of the coastline. But while the other two vessels later returned to their rendezvous point, Miguel’s ship vanished without a trace. The fate of the two Corte-Reals remains a mystery, but there is some evidence that Miguel may not have perished immediately after his disappearance. Enter the Dighton Rock and the 1912 discovery by Dellabarre. Delabarre stated that the markings were abbreviated Latin, and the message, translated into English, read as follows: I, Miguel Cortereal, 1511. In this place, by the will of God, I became a chief of the Indians. If genuine, these markings would suggest that Miguel managed to survive in the New World for at least nine years. Even more amazing, they imply that he eventually joined and perhaps even led a tribe of Native people. The Dighton Rock is a 40-ton boulder, originally located in the riverbed of the Taunton River at Berkley, Massachusetts (formerly part of the town of Dighton). The rock is noted for its petroglyphs, carved designs of ancient and uncertain origin, and the controversy about their creators. In 1963, during construction of a coffer dam, state officials removed the rock from the river for preservation. It was installed in a museum in a nearby park, Dighton Rock State Park. The boulder has the form of a slanted, six-sided block, approximately 5 feet (1.5 m) high, 9.5 feet (2.9 m) wide, and 11 feet (3.4 m) long. It is gray-brown crystalline sandstone of medium to coarse texture. The surface with the inscriptions has a trapezoidal face and is inclined 70 degrees to the northwest. It was found facing the water of the bay.In 1680, the English colonist Rev. 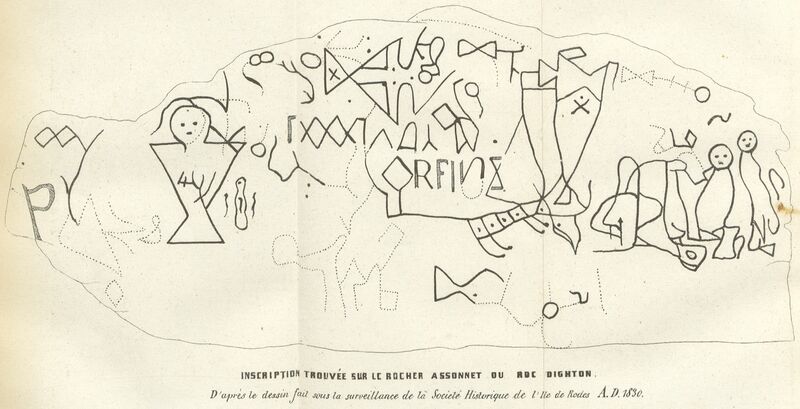 John Danforth made a drawing of the petroglyphs, which has been preserved in the British Museum. His drawing conflicts with the reports of others and the current markings on the rock. He only drew the top half of the rock, possibly because the lower part was underwater most of the time. You can see the various drawings, and how they changed over time, here. One thing is certain, that former descriptions of the depth of the incisions cannot be used as evidence for any change. The first who describes them calls them “deeply engraved” in 1690; but Cotton Mather had never seen the rock, so far as we know, and this statement of his is doubtless on a par with his other statement that the characters are on “a mighty Rock.” Greenwood gives the first reliable description, in 1730. He definitely says that the “indentures are not very considerable”’ and his drawing and his other statements prove that he had as much difficulty in making out the real characters as has ever been experienced since then. Even on the lowest part of the face, which alone does show evident signs of much wear, Mather’s draughtsman, and Greenwood, and their next followers, were even successful in making out apparent characters than have been some later observers. Sewall in 1768 and Kendall in 1807 made definite statements to the effect that the greater part of the lines were so much effaced as to make their decipherment impossible, or wholly subject to the fancy. An 1830 drawing is shown below. I have a hard time seeing anything that looks like either Latin, letters of any type of numbers as reported 82 years later. “WHEATON(1844) p564 The Dighton Stone – 1830” by Image extracted from page 564 of Histoire des peuples du nord, et des Danois et des Normands, by WHEATON, Henry. Original held and digitized by the British Library. Copied from Flickr.Note: The colours, contrast and appearance of these illustrations are unlikely to be true to life. They are derived from scanned images that have been enhanced for machine interpretation and have been altered from their originals.This file is from the Mechanical Curator collection, a set of over 1 million images scanned from out-of-copyright books and released to Flickr Commons by the British Library.View image on Flickr View all images from book View catalogue entry for book.English | +/−. Licensed under Public Domain via Wikimedia Commons. There have been rocks engraved with app. messages that were translated in various totally different ways over the decades. I, for one, can not discern the alleged inscription about Cortereal or even “1511” in the drawing provided.